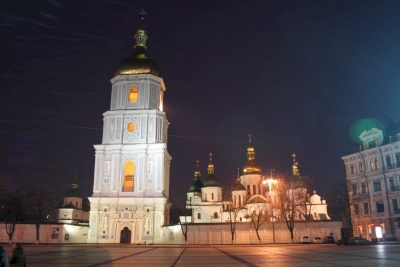 Kyiv: Saint Sophia Cathedral with Related Monastic Buildings, St. Cyril's and St. Andrew's Churches, Kyiv-Pechersk Lavra is part of the Tentative list of Ukraine in order to qualify for inclusion in the World Heritage List. There are three most sacred places for Russian/Eastern European Orthodox Christians to visit: Sergiev-Possad Lavra, Mt. Athos an Kyiv-Pechersk Lavra, lavra being the highest in the hierarchy of the Orthodox monasteries. We visited this one on our road trip from Slovakia through Hungary and Romania to Ukraine, to see Chernobyl and some other sites in 2012 - the early stages of our WHS travels where we basically looked at what was around and visited that. We saw the lavra with my classmate from Oxford, Kirill, very religious person, so that added another layer to the whole experience. From architectural side of things, it's like any other Orthodox chuches if you've already seen some. The thing that differentiates it is the complex of undergound caves dug by the monks which is now a final resting place for many of them. We had a Russian-language tour with local devout people. Women, wear a long skirt as per other Orthodox monasteries, but they provide wrap skirts if you don't have one. Then you receive a wax candle that will be your only source of light as for some religious reasons, the artificial light is not allowed inside. Warning, don't go if you're claustrofobic, because you're in for a ride. So we entered, a group of about thirty people and we were walking along these small corridors, candles in our hands. There was so much candle waving I was afraid my headscarf would catch on fire. The atmosphere is spooky, aided by the fact you're walking past coffins. Most of the mummified monks are covered with a hand or a foot uncovered here and there. The Orthodox folks with us were running around, trying to kiss each of the glass coffins, it was truly bizarre. There is lot of mysticism woven into the tour narration, how the prayers mummified the bodies, etc. It is an experience that will stay with you, I guess more so if you're religious, otherwise you will be just baffled.